International Bacon Day is coming up on Saturday, September 1st! International Bacon Day (aka Bacon Day) is a special holiday for everyone who loves Bacon. Annually celebrated on the Saturday before Labor Day, this is one of the most popular unofficial holidays in the USA. Bacon Day was started in 2000 by a group of students from Bedford, Massachusetts. They decided that Bacon was so delicious, that it deserved its own holiday...and they were right!! Bacon Day celebrations include social gatherings that eat food and drink beverages containing Bacon. These meals include breakfasts, lunches, dinners, desserts, and lots of snacks. 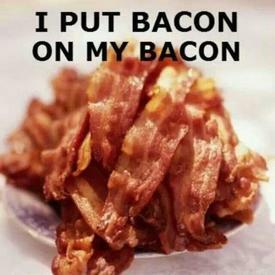 How will you celebrate Bacon Day?